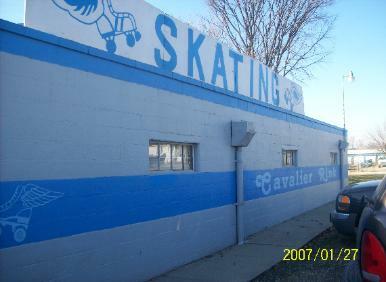 The first Cavalier Roller Rink was opened in March of 1940 in the old Eagles Hall on Walnut Street in Chillicothe. It was operated by Irvin Whetsel, John Whetsel, and Robert and Roberta (Whetsel) Ward. When the building was sold, they moved to two buildings in Washington Court House and Hillsboro. Both John Whetsel and Robert Ward were called to service in World War II and the rinks were closed. Robert Ward was killed in the service in France in 1944. After the war, Roberta Ward married Bill Breakfield and the family went on the road with portable rinks. The sections of flooring and huge tents were loaded up on flatbed trucks, and the whole operation toured throughout Ohio, much like a traveling circus or carnival. The "portable rink" was then taken to Georgia in 1948 before being brought back to Chillicothe and Jackson, Ohio. In 1949, The Cavalier Roller Rink in Jackson, Ohio was built, using a portion the flooring from the portable rink, which remains today. In 1950, Bill and Roberta Breakfield (Ward) built the Cavalier in it's present location in Chillicothe, Ohio. Both Cavalier Rinks have remained in continuous operation by the descendants of the Whetsel family.